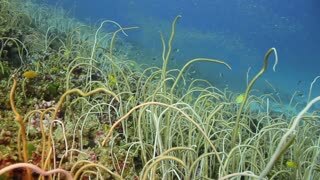 Search Results for "seabed coral"
An underwater shot showing a huge sinkhole on the ocean floor. Coral covers the surrounding of the ocean floor. Sea turtle on clean clear underwater seabed eats coral in Maldives. Beautiful marine background. Swimming in world of colorful wildlife of reefs. Abyssal relax diving. Unique video closeup footage. Crab underwater on seabed in coral in search of food in ocean. Swimming in world of colorful beautiful wildlife of reefs and algae. Abyssal diving. 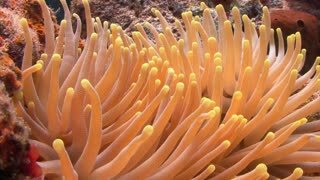 Beautiful seabed with corals and sunlight, slow motion. Crab underwater on seabed in coral of ocean. Swimming in world of colorful beautiful wildlife of reefs and algae. Inhabitants in search of food. Abyssal diving. Waterline view blue sea water, coral on sandy bottom and cloudy sky landscape. Underwater view ocean bottom, swimming fish among coral and overcast sky. Marine life and cloudy skyline. School of fish underwater on background of coral seabed in Maldives. Unique video footage. Abyssal relax diving. Natural aquarium of sea and ocean. Beautiful animals. a blacktip reef shark swimming close to the sea bottom filled with corals. Fish underwater on background of amazing coral seabed in Maldives. Unique macro video footage. Abyssal relax diving. Natural aquarium of sea and ocean. Beautiful animals. School of fish underwater on background of amazing coral seabed in Maldives. Unique unusual video footage. Abyssal relax diving. Natural aquarium of sea and ocean. Beautiful animals. 1970s: Men scuba dive close to seabed, one man looks at his watch. A jellyfish swims near coral reefs. Scuba diver swims between corals. Coral reefs in deep sea. A stingray swims near seabed. a school of juventile barracudas is hanging around a sea bottom filled with stunning corals of acropora. The sun is shining down on the incredible reef. Underwater shooting while scuba diving. Sea fish swimming on coral reef landscape. Swimming fish among beautiful coral on sea bottom. Underwater world and marine life. Triggerfish unicorn fish underwater eats coral on seabed in Maldives. Unique macro video closeup footage. Abyssal relax diving. Natural aquarium of sea and ocean. Inhabitants in search of food. Shark underwater in search of food amazing coral on seabed Maldives. Unique amazing video footage. Abyssal relax diving. Natural aquarium of sea and ocean. Beautiful animals.